The key to these wonderful cookies is to use a high quality raspberry jam, since most of the flavor in the cookies comes from the jam. You can tell a quality jam by the ingredients,which are on the label in the order of the ingredient quantities, from most to least. At Persimmon Hill Farm, we have berries as the first ingredient, followed by just cane sugar, lemon juice and pectin. You’ll definitely taste the difference! You’ll need 2 cookie cutters: a base design and a smaller cutter for the sandwich top. I use a large heart and a smaller heart, but any shapes will work. Preheat oven to 350° F. In a large bowl, mix softened butter and flour together with a pastry blender until mixture is crumbly. In a smaller bowl, beat eggs with sugar until well mixed, then add honey or maple syrup. In another bowl, mix lemon juice or vinegar with baking soda. Pour this and egg mixture into the flour & butter and blend. The dough will be stiff and sticky. Dust a large cutting board or other surface with flour. Using a portion of the dough at a time, roll out with floured rolling pin to about 1/8 in. thick. Using the largest cookie cutter, cut out shapes and place on cookie pans lined with parchment paper, making an equal number of cookies on each pan. Then with the smaller cookie cutter, cut a shape in the center of the cookies on one pan only. 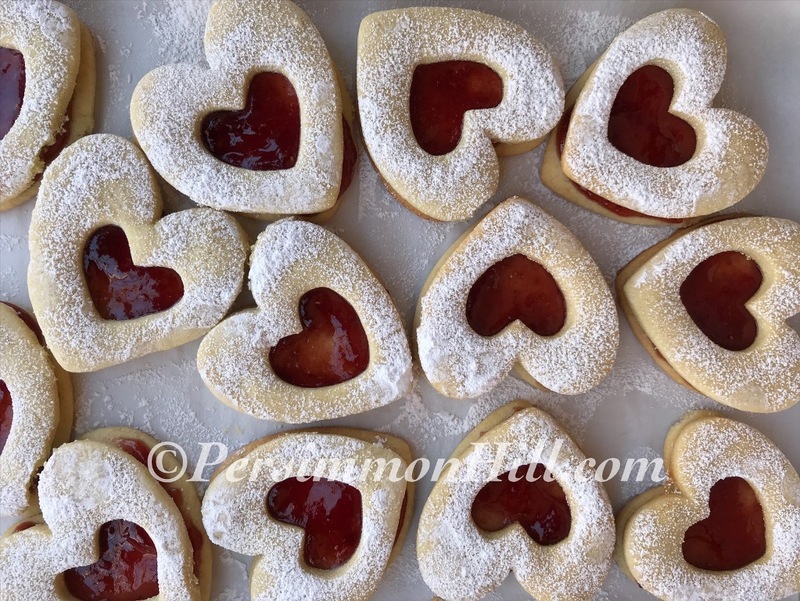 (You can work these cut-outs back into the dough or save for Jam Thumbprint Cookies – another recipe). These will be the tops for the cookie sandwiches. Bake for 8 to 10 minutes, or until cookies just barely begin to turn brown on top. Remove from the oven and cool until firm. To assemble,spread the pan of whole cookies with the raspberry jam, leaving more in the middle than at the edges. Using a small sifter or strainer, sift powdered sugar over the cookies with the cut-outs in the other pan. Then place the cut-out cookies atop the jam-covered cookies to finish. These soft, raspberry-amazing cookies are a great way to anyone's heart! This is a holiday favorite dish with with blueberries and a lot of flavor! Creamy and flavorful, this is the best mushroom soup you'll ever find! A really delicious, easy recipe - Sweet with just the right amount of heat. These are super moist corn muffins loaded with the flavor of blueberries! You have to try this divine Blueberry Poppyseed Dressing - light and easy! A sumptuous serving, warm and sweet, made in seconds in the microwave! Frozen blueberries make a simple, healthy and delicious frozen dessert.